Successfully Added Haier Leader iSee Mini Projector - 50 Inch Projection, Android OS, Quad Core CPU, Wi-Fi, Bluetooth, Miracast, Happy Cast to your Shopping Cart. The iSee mini projector from established electronics company Haier is a portable projector like no other. 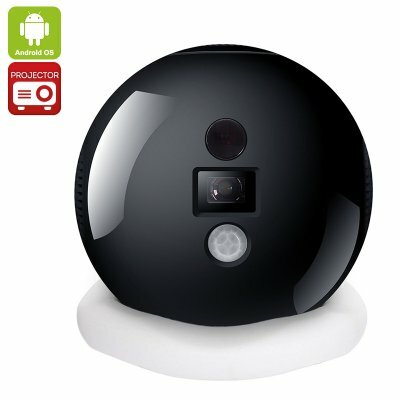 Adopting a unique and eye-catching spherical appearance this projector can be rotated to project from almost any angle. Running on an Android operating system and with wireless technology, you can use Happy Cast or Miracast to share the screen of your Android or iOS device such as smartphone and tablet PC. With a micro SD card slot, USB as well as Wi-Fi and Bluetooth you'll find there are plenty of ways to play share and enjoy movies with this stylish mini projector. The remote controller provides easy navigation options or attentively use the USB port for an air mouse or game controller and surf the web, play games or watch movies using the millions of Android apps available from the app store. A large built-in battery means you have 2 hours of portable play time before needing a recharge so you can enjoy a movie on the go or away from home. Haier Leader iSeemini Mini Projector comes with 12 months warranty, brought to you by the leader in electronic devices as well as wholesale mini projectors and home theater gadgets..